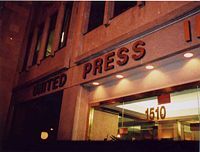 Front of UPI Headquarters, Washington, D.C.
United Press International (UPI) is a global news agency, headquartered in the United States. The company was founded in 1907 by Edward W. Scripps who believed that there should not be restrictions on who could purchase news from a news service, in opposition to Associated Press (AP), which is a cooperative owned by its members who both contribute and use its stories. UPI was successful for several decades, with a large number of well respected "Unipresser" reporters associated with it. It is one of the world's major news agencies, along with the Associated Press, Agence France-Presse, and Reuters. Today, UPI is owned by News World Communications and files its news stories in English, Spanish and Arabic. UPI has offices in Washington DC, Beirut, Hong Kong, London, Santiago, Seoul, and Tokyo. Newspaper publisher Edward W. Scripps (1854 — 1926) created the first chain of newspapers in the United States. After the Associated Press (AP) refused to sell its services to several of his papers, Scripps combined three regional news services—the Publisher's Press Association, Scripps McRae Press Association, and the Scripps News Association—into the United Press Associations, which began service on June 21, 1907. Scripps founded United Press on the principle that there should be no restrictions on who could buy news from a news service. The AP was owned by its newspaper members, who could simply decline to serve the competition. Scripps had refused to become a member of AP, calling it a monopoly. Scripps believed that there should be no restrictions on who could buy news from a news service and he made UP available to anyone, including his competitors which soon included William Randolph Hearst's International News Service. This formula made UP a direct threat to the alliances of the major U.S. and European wire services of the time. Frank Bartholomew, UPI's last reporter-president, took over in 1955, obsessed with bringing Hearst's International News Service (INS) into UP. Bartholomew put the "I" in UPI on May 24, 1958, when UP and INS merged to become United Press International. Hearst, who owned King Features Syndicate, received a small share of the merged company. The new UPI had 6,000 employees and 5,000 subscribers, 1,000 of them newspapers. Lawyers on both sides worried about anti-trust problems if King competitor, United Features Syndicate, remained a part of the newly merged company, so it was made a separate Scripps company. This deprived UPI of a persuasive sales tool and the money generated by Charles M. Schulz' popular Peanuts and other comic strips. Later that year, UPI launched the UPI Audio Network, the first wire service radio network. In 1960, subsidiaries included UFS, the British United Press, and Ocean Press. United Press Movietone, a television film service, was operated jointly with 20th Century Fox. The Associated Press was a publishers' cooperative and could assess its members to help pay for extraordinary coverage of such events as wars, the Olympic Games, or national political conventions. UPI clients, by contrast, paid a fixed annual rate—UPI could not ask them to help shoulder any extraordinary coverage costs. Newspapers typically paid UPI about half what they paid AP in the same cities for the same services. At one point, for example, The Chicago Sun-Times paid AP $12,500 a week, but UPI only $5,000; the Wall Street Journal paid AP $36,000 a week, but UPI only $19,300. UPI was hurt by changes in the modern news business, including the closing of many of America's afternoon newspapers, resulting in a shrinking of its customer base. It went through seven owners between 1992 and 2000, when it was finally acquired by News World Communications, owner of the Washington Times. Because News World Communications was founded by Reverend Sun Myung Moon, founder of the Unification Church, this purchase raised concerns about editorial independence. Most notable in this context was UPI's best-known reporter, Helen Thomas, who resigned her position as UPI's chief White House correspondent after 57 years. Others, including Martin Walker, editor of UPI's English edition, a winner of Britain's Reporter of the Year award when he was Deputy Editor-in-Chief at The Guardian, said they experienced "no editorial pressure from the owners." With investment from News World in its Arabic and Spanish-language services, UPI has stayed in business. In 2004, UPI won the Clapper Award from the Senate Press Gallery and the Fourth Estate Award for its investigative reporting on the dilapidated hospitals awaiting wounded U.S. soldiers returning from Iraq. News people who worked for UPI are nicknamed "Unipressers." Famous Unipressers from UPI's past include journalists Walter Cronkite, David Brinkley, Howard K. Smith, Eric Sevareid, Helen Thomas, Pye Chamberlayne, Frank Bartholomew, Hugh Baillie, Vernon Scott, William L. Shirer (who is best remembered today for writing The Rise and Fall of the Third Reich) and The New York Times' Thomas Friedman. Richard Harnett, who spent more than 30 years at UPI, recalls what is often considered its greatest achievement—Merriman Smith's Pulitzer Prize-winning coverage of John F. Kennedy's assassination. "Smith was in the press car...When he heard shots, he called in to the Dallas, Texas office and sent a flash bulletin," Harnett says. "The AP reporter started pounding on his shoulder to get to the phone, but Merriman kept it from him." UPI photographers saw their work published in hundreds of publications worldwide, including LIFE, LOOK, and other magazines, as well as newspapers in the United States. Under their work, the only credit line was "UPI." Not until after the 1970s, when their names began appearing under their pictures, did a number of UPI's photographers achieve celebrity within the journalism community. David Hume Kennerly won a Pulitzer Prize for Vietnam coverage. Tom Gralish won a Pulitzer Prize and the Robert F. Kennedy Journalism Award in 1986 after leaving UPI for The Philadelphia Inquirer. Dirck Halstead founded The Digital Journalist; Gary Haynes authored a book, Picture This! the inside story of UPI Newspictures (2006). Other well-known photographers from UPI include Joe Marquette, Darryl Heikes, Carlos Shiebeck, James Smestad, and Bill Snead. On June 21, 1907 United Press Associations began service. In 1908, UP pioneered the transmission of feature stories and use of reporter bylines. In 1914, Edward Kleinschmidt invented the teletype, which replaced Morse code clickers in delivering news to newspapers. Press critic Oswald Garrison Villard credits United Press with the first use of the teletype. In the 1920s and 1930s, United Press pioneered its financial wire service and organized the United Feature Syndicate. Founded in the 1930's was "Ocean Press," a news service for oceanliners, comprised of copy from United Press and later United Press International. This ship-board publication was published by a separate corporate subsidiary of Scripps, but essentially under one roof with UP/UPI at the Daily News Building in New York. The subheadline under the "Ocean Press" logo was: "WORLDWIDE NEWS of UNITED PRESS . . . TRANSMITTED by RADIOMARINE CORPORATION OF AMERICA" ... which appears to have been a subsidiary of RCA. Some mastheads were labeled "UNITED PRESS - RCA NEWS SERVICE." In 1935, UP was the first major news service to offer news to broadcasters. In 1945, it launched the first all-sports wire. In 1948, UP Movietone, a newsfilm syndication service, was started with 20th Century Fox. In 1951, United Press offered the first teletypesetter (TTS) service, enabling newspapers to automatically set and justify type from wire transmissions. In 1952, United Press launched the first international television news film service. The United Press March, as written and performed by the Cities Services Band of America under the direction of Paul Lavalle, debuted at the Belasco Theater in New York on December 9, 1952. The UPI March was also played at the coronation of Queen Elizabeth II. In 1953, UP had the first, fully automatic photo receiver, UNIFAX. In 1958, it launched the UPI Audio Network, the first wire service radio network. In 1974, it launched the first "high-speed" data newswire—operating at 1,200 WPM. On April 19, 1979, UPI announced an agreement with Telecomputing Corp. of America to make the UPI world news report available to owners of home computers. Later, UPI was the first news service to provide news to dial-up services such as Prodigy, CompuServe and world-wide web search pioneers Yahoo! and Excite. In 1981, UPI launched the first satellite data transmissions by a news agency. In 1982, UPI pioneered an eight-level Custom Coding system that allows clients to choose stories based on topic, subtopic and location. It developed one of the first news taxonomies. In 1984, UPI descended into the first of two Chapter 11 bankruptcies. In this period, a series of owners and managers tried launching several new products, while downsizing the original service. In 1988, UPI broke the "all or nothing" news service tradition by introducing component products. In 1998, UPI sold its broadcast operations to AP Radio, which shut it down and converted clients to its own service. In 2000, UPI launched a multi-lingual editorial and content management system CMS. In 2001, UPI develops and launches a multilingual editorial and distribution system, known as “Bernini,” used by all UPI offices around the globe. On October 14, 2005 UPI launched a direct-to-consumer web site. In 2007, UPI celebrated its 100th year in existence. ↑ Roy Wilson Howard DePauw. Retrieved August 8, 2007. ↑ About Us UPI. Retrieved August 8, 2007. ↑ Milestones UPI. Retrieved August 8, 2007. Wittstock, Melinda. "UPI star escapes Moon's orbit: The agency taken over by Moonies has lost its respected inquisitor of Presidents" Observer, May 21, 2000. History of "United Press International"
This page was last modified on 8 January 2016, at 16:53.